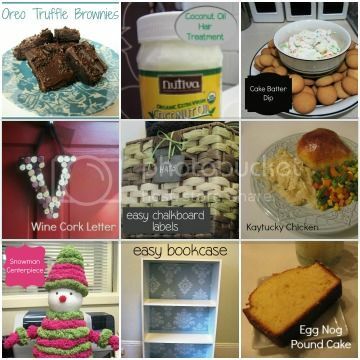 Yesterday, the baking bug hit me and I decided to try something new from my Recipes to Try board on Pinterest. I went with Oreo Truffle Brownies. The original pin is from Chef in Training. The recipe is basically taking the Oreo Truffles I've made in the past and spreading them over some brownies. The original pin gives directions on how to make brownies from scratch. I decided to take a short cut and used the boxed stuff. Not only is it easier, but I've tried making brownies from scratch before and they never turn out as good as the box mix. However, I did decide to try a different brand of brownie mix. Usually I go with Betty Crocker but this time I gave Duncan Hines a shot. I whipped up the brownies as directed on the box. While they were cooling, I got the truffle layer together. 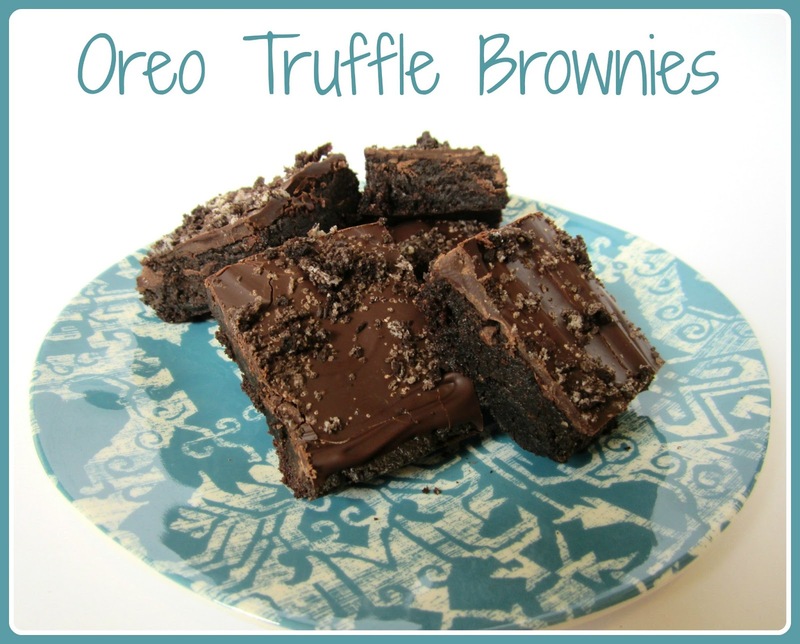 You just take softened cream cheese and mix it with finely crushed Oreos. I threw the mixture on top of the cooled brownies. It was a little challenging to spread out the mixture on top of the brownies. I found that using a small spatula was the easiest way to do it. And evenly spread it on top. Right after spreading the chocolate on top, I poured some crushed Oreos on top to garnish. Then I covered the brownies and threw them in the fridge for 2 hours so the chocolate could harden. The Verdict: These are delicious and very rich. In addition, they were super easy to make. I will say that when I was slicing the brownies, a few of them had the truffle layer separate from the brownie layer. Things to Consider/Change: I wouldn't really change anything with this recipe. Perhaps if I were to make these again, I would bake the brownies in a smaller dish so the brownie layer turned out a bit thicker. Bake brownies as directed on the box. Allow to cool. Crush Oreos in food processor or in a zip lock bag with rolling pin. Using your hands, mash softened cream cheese and crushed Oreos until well combined. Start with 4oz of cream cheese and add more if desired. 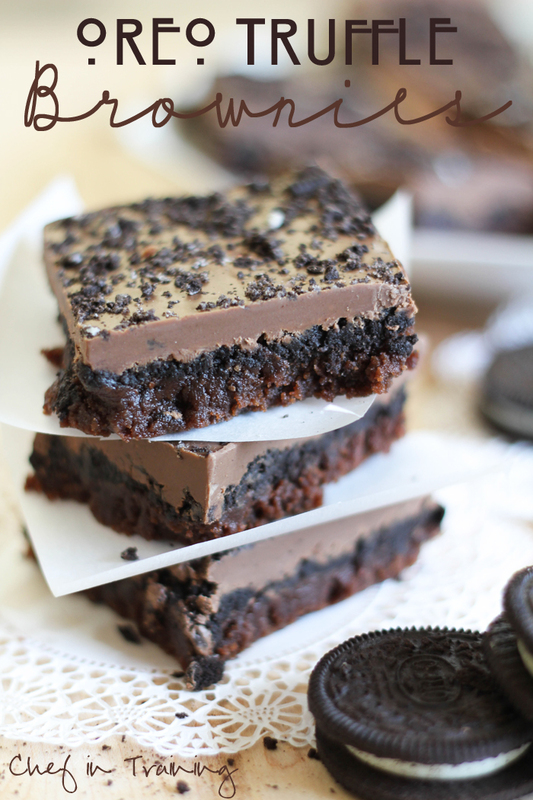 Spread layer of Oreo truffle on top of cooled brownies. Melt chocolate and pour on top of the Oreo truffle layer. Sprinkle additional crushed Oreos on top of the chocolate. Cover and put into the fridge until set.